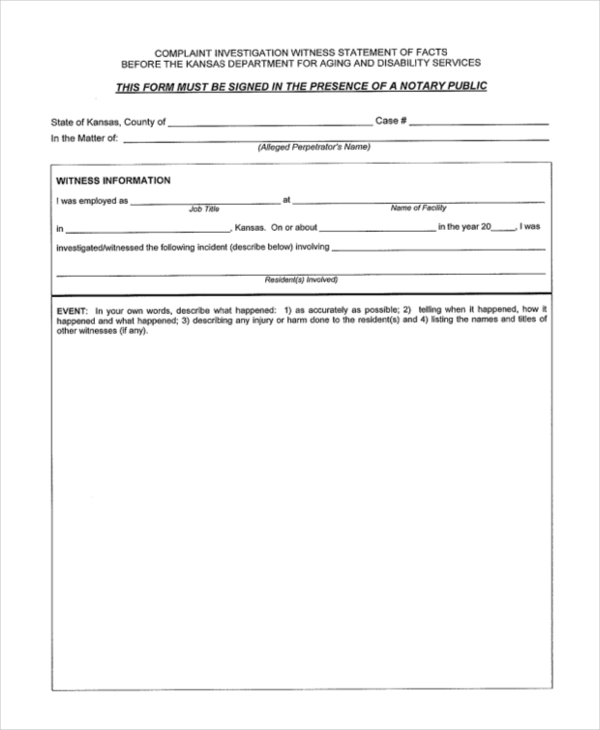 A blank witness form is actually a sample of how a witness form should look. It usually contains all the crucial subheads that should be present in such a form. However, the user can further customize it to suit his needs. 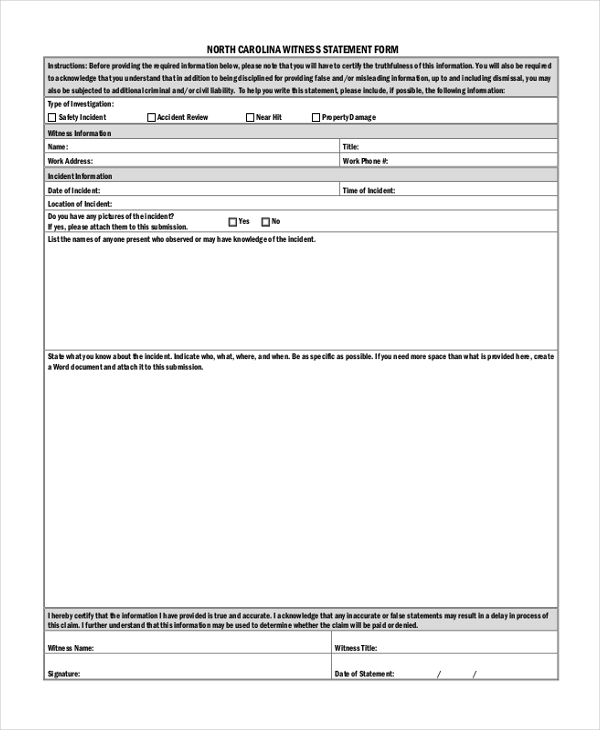 As the name suggests, this form is used by the police department to record the confession of the witness who may have been present at the time of some illegal transactions or acts of crime. This form is used by a police officer or a lawyer to put down the statement of the person who may have witnessed an accident. The form allows the authority concerned to record the statement in a systematic manner. 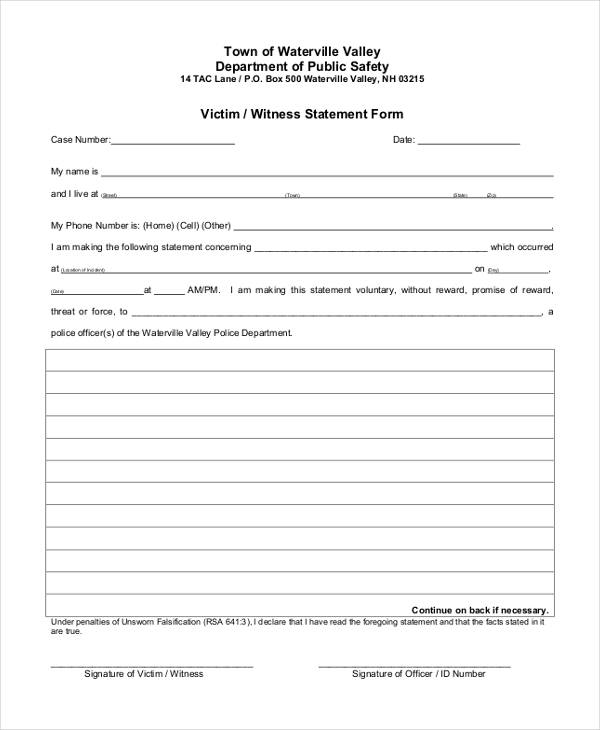 A witness who may have been privy to a case of harassment of a person can file a complaint with the police department or a government body by filling in the details of the incident in this form. This statement forms is generally used in schools or colleges to record the misdeeds carried out by the students. 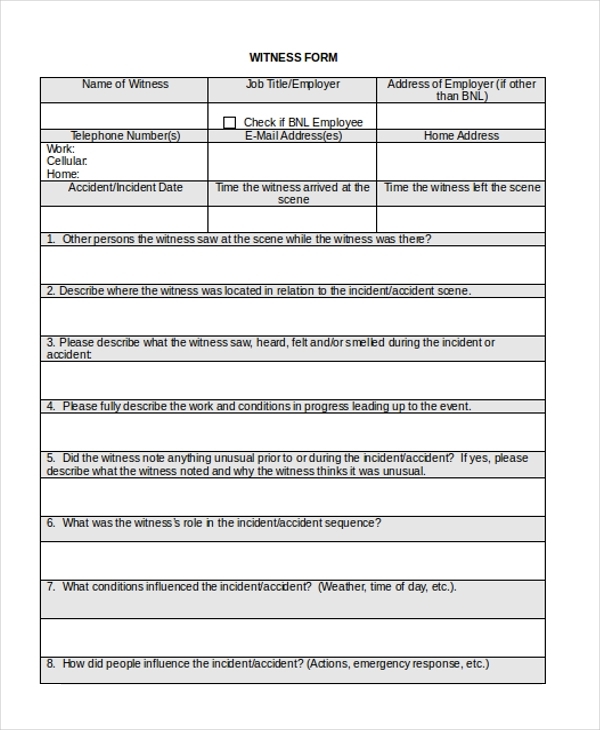 The form is mainly filled in by a teacher or management official and is used to record the statement of the person who might have seen the misdeed happening. This is a witness statement form that is used by the police officials or a lawyer to record the statement of the victim who was subjected to a crime or other illegal deeds. The form is also used to record the statement of the close family members of the victim. This is a specially designed witness statement form for the state of North Carolina. 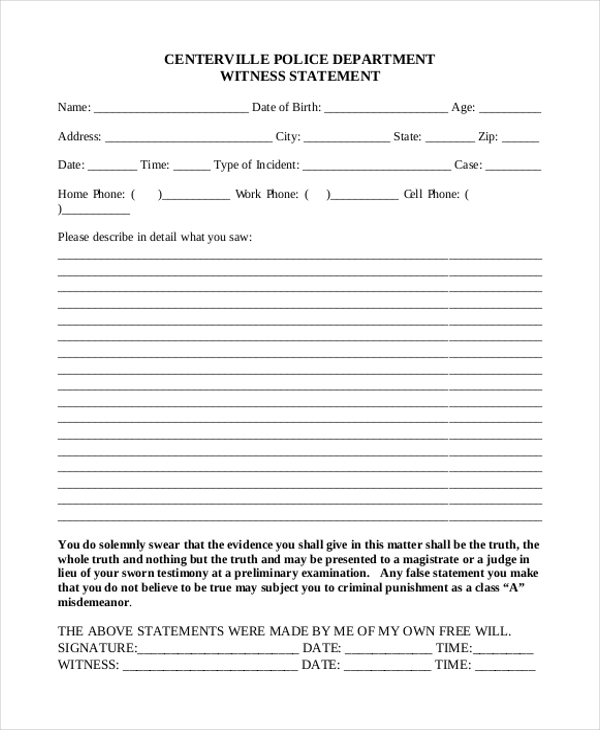 The law authorities here use this form to take down the statement of the witnesses. These forms are in sync with the law and regulations of the state. Used by the police authorities and other investigating agencies who may be acting on the basis of a complaint, this witness statement form is used pen down what the witness may have to say about the whole incident that led to the complain. 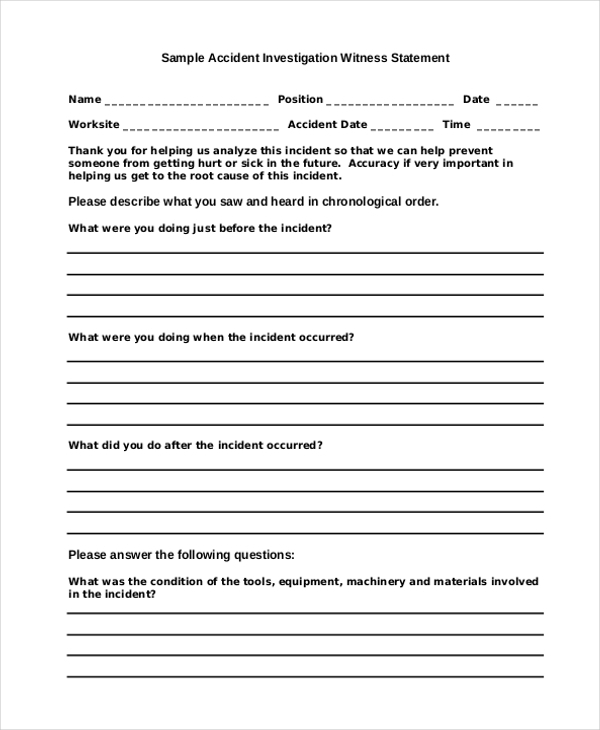 An employee witness form is used by an employer to record the details of an untoward incident that may have occurred on the company premises. In this case the witnesses are usually the employees of the organization. As the name indicates this form is used to take down the details that a witness confesses in the court of law about a crime or an incident. 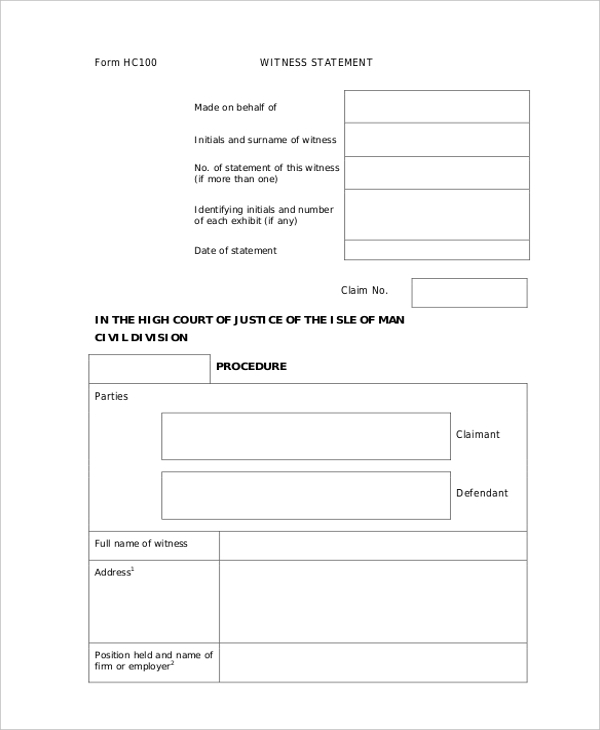 This form is used by the lawyers as well as the court officials to record the statement given during proceedings. Why Should one Use a Witness Statement Form? What are the Benefits of Using a Witness Statement Form? A witness statement form is designed by experienced professionals and thus has a very distinctive look. It allows the user to record the statement in a very systematic and organized manner, thus making it easier to refer to the statement on a later date. The forms can be customized as per the need of the user which is surely an added benefit. These forms once sealed or signed by the concerned authority are considered to be valuable proof in the judicial court. How Should One Design a Witness Statement Form? A witness statement form comes in handy in the court of law which is why you need to give its design some thought. In case, you do not have enough time to design one, go ahead and look for witness statement forms online. These are readily available and can be easily downloaded and personalized.